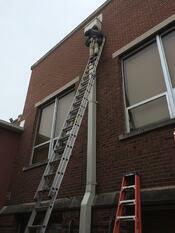 Commercial Gutters- Greensburg Indiana Jerman Place Apts. Greensburg IN Jerman Place Apts. 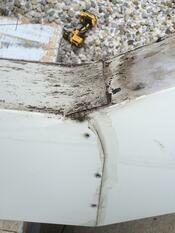 The commercial guttering at Jerman Place Apartments in Greensburg Indiana had become damaged from last winters several ice and snow build ups. Exterior Pro Roofing was called in to replace the large downspouts and add fittings to direct water into drainage pipes. The building’s director and maintenance personnel started to notice dark streaks and water stains behind and around the 7x7 square commercial downspouts. The stains seemed to originate around connection where the downspouts had come apart from the weight of ice and snow that had accumulated inside them. These particular downspouts are located in a place between two buildings where little of any sunlight reaches. The large flat roof above drains into a collector head box and then into these downspouts so it is crucial that they function properly. Exterior Pro Roofing ordered 60’ ft of new 7” x 7” 24 gauge commercial downspout in the same color as the existing and scheduled the job. 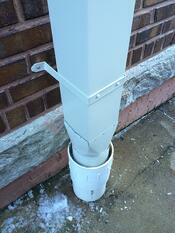 We were able to detach the damaged downspout from the collector head box which was in good working order. Next our skilled sheet metal foreman field fabricated the elbows into lower section of the downspout to adjust for wall thickness change. Once the first section was installed we continued upward setting two more section of downspout and using rivets to secure it in place along the way. We straightened the three sections of downspout with the collector head box and the drainage pipe below and strapped it to the wall at the connections in the downspouts. Finally we installed a custom gutter fitting called a square to round which moves from a square fitting to a round fitting in order to slide into drainage pipe. Once the new downspouts were up and flowing properly we cleaned up the job site, disposed of the trash, and hauled away the old downspouts. Another quality commercial guttering job done by Exterior Pro Roofing. 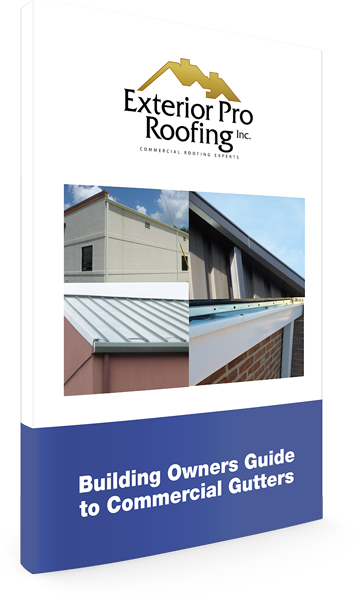 Download this guide and learn the types of gutters, why commercial guttering is so important, how to maintain them, and troubleshooting and repair options for commercial gutters.